Medical linear accelerators are the key equipment used for delivering radiotherapy treatments. 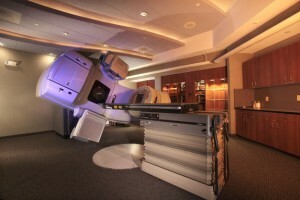 Standing approximately nine feet tall by nearly 15 feet long and weighing as much as 18,700 pounds, the accelerator consists of four major components: an electronics cabinet called a “stand,” housing a microwave energy generating source; a rotating gantry containing the accelerator structure that rotates around the patient; an adjustable treatment couch; and operating electronics. Accelerators are located within specially constructed concrete treatment rooms to provide X-ray shielding. In operation, microwave energy, similar to that used in satellite television transmission, is used to accelerate electrons to nearly the speed of light (186,000 miles per second). They attain this velocity in a short distance, typically one meter or less. As they reach maximum speed, they collide with a metal target, which in turn releases photons, or X-rays, with such energy they are measured in millions of volts (MV). Certain models can be switched so that the electrons bypass the target for direct electron therapy. This energy is measured in millions of electron volts (MeV). Radiation oncologists and physicists use electron or photon therapies for different types of cancer treatments. Generally speaking, photons (X-rays) are used for treating tumors deep within the body. Electrons, which cannot penetrate deep tissue, are used for more superficial disease including some skin cancers and shallow head and neck lesions. As the radiation strikes human tissue, it produces (largely from naturally occurring water in the body) highly energized ions that are lethal to both normal and malignant cells. While both good and bad cells suffer from radiation, healthy cells can adapt over successive regenerative cycles. Malignant cells do not possess this adaptation mechanism and thus do not survive, a fact that generally dictates the practice of administering repeated radiation treatments rather than a single blockbuster dosage.